For reporting period 42 (5/9/2016-6/9/16), 229 needles found in public spaces were logged. 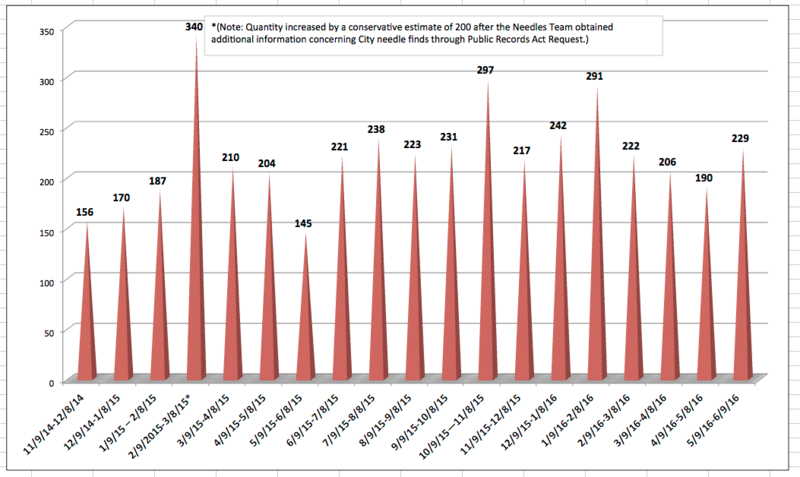 This count includes citizen reports, community group reports and reports by City workers. 41 needles were found by citizens and community groups; the other 188 needles were found by City workers. City workers found needles in various public restrooms. Pursuant to Cal Health & Saf Code § 121349.3, the County Health Officer is required to compile a report on its syringe program every two years. A meeting allowing public comment – with ample notice – is also required. It has now been over two years since the last report and the last Board of Supervisors meeting with public comment. Please advise as to when the public should expect the latest report, as well as be permitted to comment on the Syringe Services Program.